The breadsticks start with an easy pizza dough recipe which is perfectly chewy and flavorful (thanks to a hint of garlic salt) on the inside but crispy on the outside then a melted garlic and Italian seasoning butter brushed on, and covered by a thick layer of shredded cheeses, parmesan and parsley. Dovetailing tip: Double the recipe for these breadsticks. Use the additional pizza crust to make the dessert for today - Fruit Pizza. In a medium sized bowl, whisk together flour, garlic salt, sugar, yeast and slowly add in water. Mix together until dough is created. Using your hands knead for one minute and form a ball. Spread 1 tablespoon of olive oil in a separate bowl and transfer pizza dough to that bowl. Cover with a paper towel for 1 hour or until dough has doubled. Reheat oven to 425 degrees. Roll out dough on your pizza stone or baking sheet. Add butter, garlic powder and Italian seasoning to a small bowl and microwave until melted. Whisk together then brush on dough. Next sprinkle dough with shredded cheese then parmesan cheese. Lastly, sprinkle with parsley. Bake for 15-17 minutes or until dough has browned and cheese is melted and golden. 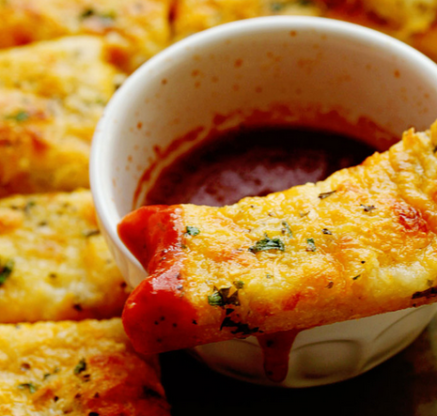 Cut bread into sticks and serve with warm pizza sauce if desired. Beautiful and Creative Ways to Top a Cake! Give Fresh Cranberries Their Due! How to Successfully Freeze ANY Baked Good! Leftover Gravy Wears LOTS of Hats! Don’t Throw Out that Rancid Cooking Oil—Here’s How to Use It! Stock, Broth, Bouillon: What’s the Difference?